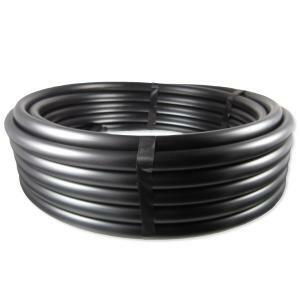 This premium agricultural grade black polyethylene tubing is made of the highest quality resins and is UV resistant. This tubing is the same as used by many commercial growers. It can be used for any landscape and gardening applications. This low pressure polyethylene tubing is used to carry water throughout a drip system. The tubing is rated for 60 PSI and is not rated for constant pressure. Polyethylene tubing is "springy" and requires time to relax to stay in place. Polyethylene tubing is often referred to as "poly tubing". Please note: Drip Irrigation tubing is nominally sized, so please note the inside and outside diameter for compatibility with fittings and other brands of tubing. These rolls of tubing will arrive tightly wound to help reduce shipping costs. Some dimpling and creasing may be visible on the inside of the roll as well as banding strap indentations. It is a normal occurrence for tightly wound rolls and does not affect the performance or durability of the tubing in any way. Looking to save a few dollars? Sometimes we have Kinked & Damaged Tubing at discount prices!